Democrats offer an olive branch in the way of tax cuts for all but the wealthiest Americans. The Republicans counter by cutting unemployment benefits for the long term out-of-work. For weeks the nation has been wondering if Democrats and Republicans in Congress would be able to hammer out a compromise on the question of the Bush-era tax cuts which are set to expire at the end of the year. The Republican leadership in both the House and Senate has called for an extension of the Bush tax cuts for all Americans, including those at the top of the salary scale. Democrats, in an odd role reversal on fiscal policy, have become concerned about deficit spending, saying that extending the tax cuts for millionaires and billionaires would increase the federal deficit by about $700 billion. In an attempt to hold the middle class tax cuts hostage, Senate Republicans have filibustered or refused to act on all pressing legislation in this lame duck session, including a new arms control treaty with Russia and consideration of extending unemployment insurance for those still struggling to find work. Leadership of both houses of Congress met with President Obama during the past week. All parties emerged claiming the meeting with “a good start,” sounding as though the basis for a compromise on the tax cut issue was possible. Sen. Charles Schumer (D-NY), offered a proposed compromise in the form of extending the tax cuts to those making up to one million dollars annually, but it was rejected by Senate Republicans and several prominent Democrats. As a result, if no solution is crafted by the end of the session, taxes will go up for all Americans in the form of income taxes, an increased estate tax (also called the Death Tax by Republicans), and the Alternative Minimum Tax will rise, effecting thousands of middle class Americans who are already struggling in this difficult economy to make ends meet. The political ramifications of the Republican insensitivity cannot be underestimated. 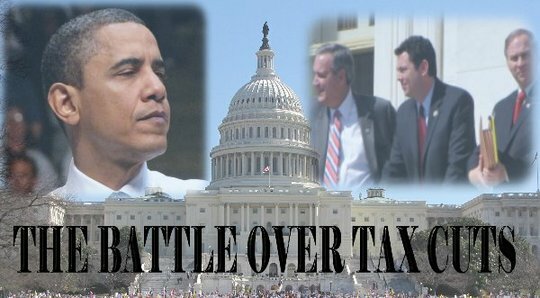 The Republican leadership is setting the Obama administration up for a sweeping victory in 2012 and a return to Democratic leadership in both Houses during that year’s congressional election. Tea Party Republicans will have to put up or shut up if they are so willing to allow the deficit to expand just to line the pockets of those Americans who are above the economic fray in this ongoing recession. Independents in the middle class and those in the Democratic base residing in the cities and rural regions of America will feel as though the Republicans have left them behind. Even members of their own party, namely Republicans who find themselves left out of the upper-class tax cuts, will reject the obstructionism of their own leadership. Their political and fiscal shortsightedness brought about by a failure to compromise in this lame duck session will lead to another four years of Democratic rule in the two elective branches of government. How the underclass in America will survive until then is another question.